Nexxus City Shield Shampoo ($12.99) When the bottle said to "experience the rich foamy lather", I laughed. When I poured a bit of the crystal clear liquid in my hand to use in the shower, I felt the luxurious lather and sheepishly grinned. I could feel the thick and creamy lather coating my strands with love. My hair was clean, but didn't feel dry! 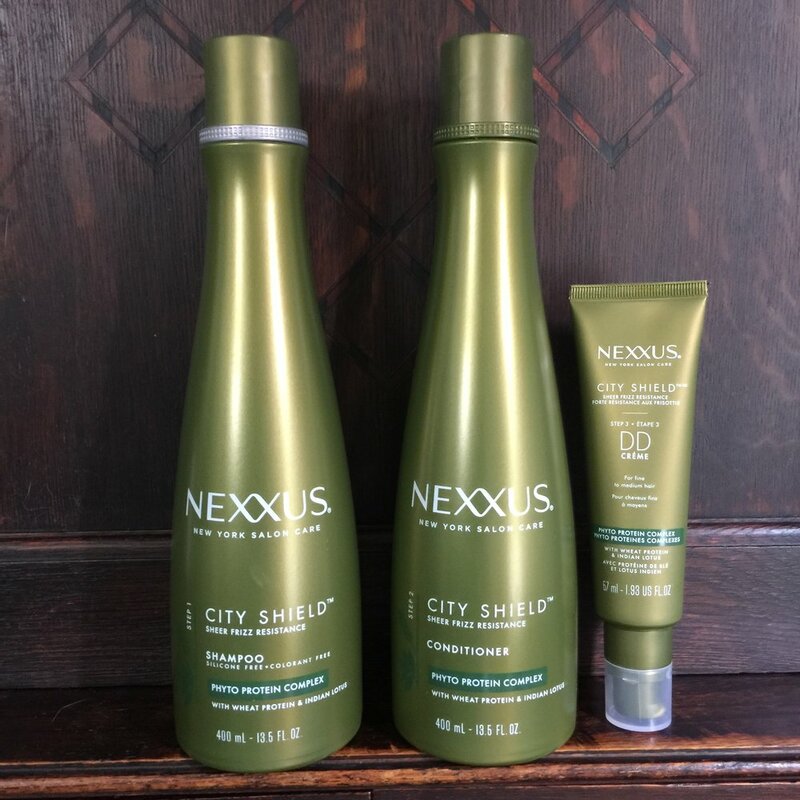 Nexxus City Shield Conditioner ($17.99) I love conditioner and how it seems to repair the drying damage from shampoo. However with the City Shield collection, I found that the shampoo was gentle enough to not need for me to use the conditioner. I still of course tried it and was immediately intrigued. It says it's silicone free, but my hair had this unique feeling of a protective silicone barrier rather than slimy slick like other conditioners. My hair was also suddenly more manageable both wet and dry. Tangles usually plague me in the shower and after, but not with this. That was even without yet applying the Hair Crème. Nexxus City Shield Hair Crème ($19.99) is my favorite part of this product collection and has become my secret weapon. The tube is elegant, soft and portable with an easy to use pump applicator with a lid. The scent is AMAZING just as with the rest of the collection. Sort of an herbal floral scent that I can't place, but it's not too overpowering to affect my allergies. In fact, I find that I want to use more just to smell it. I love that I can apply wet or dry. I've used it both ways, but take it with me for dry touch-ups when I go out. Or when I want an aromatherapy mood lift. I put it on after my hair has dried to style and tame. When I go out, it goes with me in my purse for quick touchups and does so beautifully without making my hair greasy or heavy. My hair has never been this soft or as manageable...so I'm obsessed! Despite having combination hair (oily on top, dry on bottom), I've been apply to use each product alone or together without issues. My hair seems to love it and isn't greasy nor heavy which is an impressive result for my fine, wavy mane. The frizz and manageability improved even upon the first use. I really like the bottles and how the shampoo has a silver ring to indicate it's different from the conditioner. I LOVE that the products say "Every Little Bit Helps. Please Recycle", but I am worried if they do animal testing. The ingredients aren't all natural, but Wheat Protein and Indian Lotus were botanical ingredients and the collection did effectively strengthen my hair. Also, there was no indication whether or not the collection was color safe other than "for all hair types". I've never used Nexxus due to the luxury price tag, finding no issue with popular brands available at department stores and retail giants. However, having never experienced the unique scent or surprisingly effective claims, I am reminded that some things are worth their value and the price tag. I do wish it was less expensive ($50 for the collection if purchased seperately), but the results increase the value. I will continue to use my full size bottles until they run out. If my results are different than my initial ones, I'll update this review accordingly. Have you used Nexxus before? Specifically the City Shield collection? I'd love to hear your thoughts. Salon certified Phyto Protein Complex, Wheat Protein, Elastin and naturally pollution resistant Indian Lotus to help combat the effects of humidity and UV exposure for protected, repaired and frizz-free hair. Silicone Free. City Shield Collection ($39.99) $50.97 if purchase separately. 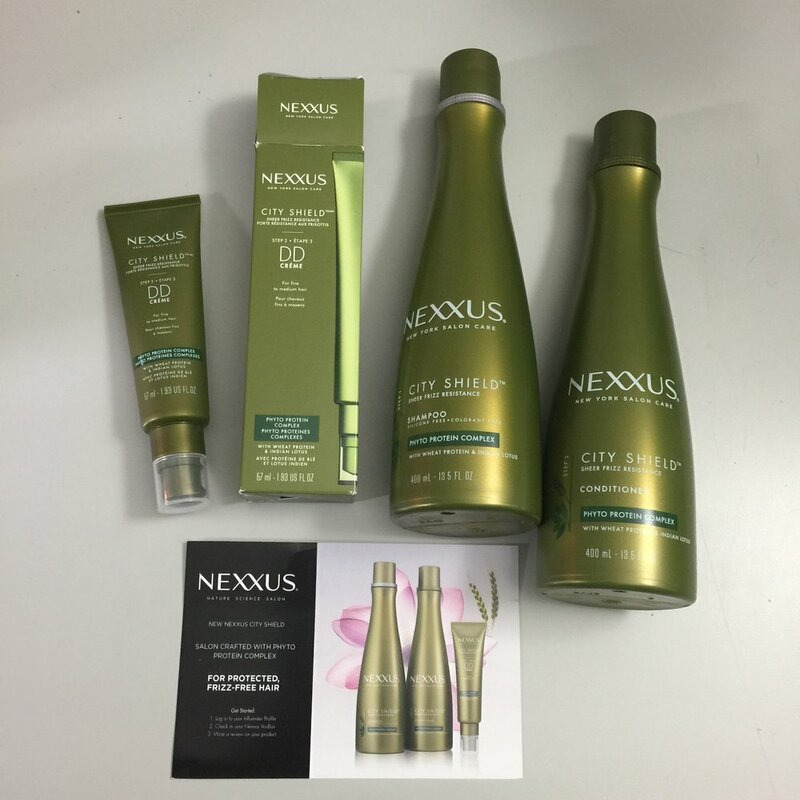 I received a full size product compliments of Influenster and Nexxus in exchange for an honest review.